Girl in the Woods by Aspen Matis. I enjoyed the movie Wild which is about about a woman in her 40s that turns to the 2650 mile hike of Pacific Crest Trail (PCT) to sort out the loss of her mother, her divorce, and life in general. Wild got much more attention (and a movie) than Girl in the Woods. It actually scooped Dorothy Parker’s journey that occurred a few years before it. 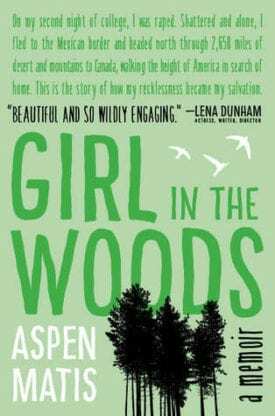 Girl in the Woods is similar, but totally different. Parker used the PCT to heal herself after being raped as a college freshman. Her transition took all of California and Oregon until a confident young woman emerged in Washington with a new name. At first, I didn’t like young Parker because of her consistent ability to make bad decisions. I’ve had similar frustration to some of the decisions and conclusions my sons reach. Realistically that’s part of being so young. Parker puts a lot of blame on her mom, but that’s also part of that age. I did enjoy the book, and wanted more as I suspect her real story begins after the hike. Red Queen by Victoria Aveyard. A fish out of water tale. Mare Barrow, 17, is a Red – the bottom of society, and through a strange set of events becomes a Silver – royalty. It’s a short book, but still a bit too long for me. Way too many adjectives. At times I was more curious to see if I would finish it than about what would happen next to Mare. I did finish it, but unsure anyone else should. There were some good plot twists, and it’s generally well regarded. Recommended for 12 year-old girls. The Hard Thing About Hard Things by Ben Horowitz. I read a lot of management books, but most of them are written by those people that crowd around craps tables because they can tell who’s good at throwing dice. I really enjoyed this book. Horowitz takes you through his experiences starting with Netscape and ending with A16z (Andreessen Horowitz). It’s a fast paced book with lots of lessons. Everything he states is so incredibly obvious, yet so easily missed. Good leaders are hard to find because they have to know so much (including their limits) that just isn’t known. That’s the hard thing about hard things – there’s no right answers. Horowitz instead offers advice on how to frame problems. He talks about things like culture, company politics, the differences between peacetime and wartime CEOs, and common predicaments that well meaning CEOs get themselves into. Every company needs a CEO – but there’s no such thing as a perfect CEO. They make tons of mistakes and must continually adapt their skills and role. He makes several references to Andy Grove’s High Output Management which also sounds great. Highly recommended for any senior leader.